Here for your viewing is another little video experiment we're tinkering with. I know people have been wanting us to do a podcast for quite sometime. And I want to do a podcast, but frankly I hate how bloated they've become. Also, I really wanted to do something with video. Oh and I like shooting people and arguing. So we came up with this. Consider what you see here a test run, a beta of sorts. We're thinking of adding more people and perhaps topics to a single run. Let me know what you think. As always, your suggestions are invaluable. But for the record, I'm not THAT flexible. 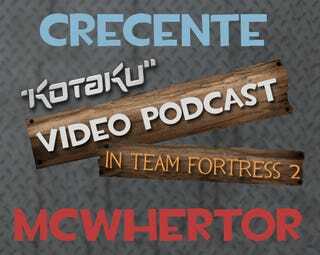 Watch Video Podcast - Team Fortress 2 on your iPod or Zune!